Healthy Active Lifestyle: To be or not to be raw baby? Nobody said you have to choose, you can mix! That's what I do. 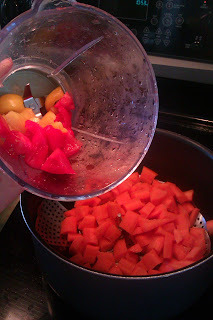 Per instance, today I pureed raw yellow bell pepper, some tomato and will be adding mashed steamed carrots prior to freezing. any puree & chia gel. 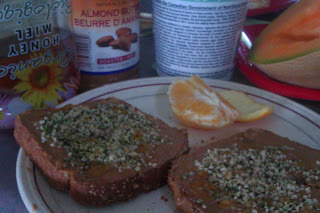 chia gel is liquidy so I don't hesitate to keep the commercial cereal on hand because it is a great thickener. You can see now that the possibilities are endless and that it is not difficult to make your baby's healthy food while introducing a wide variety of vegetables. Combinations are especially made easy when you have a small bullet type blender, a good knife and cutting board. Lucas and I are having a raw/cooked lunch too!